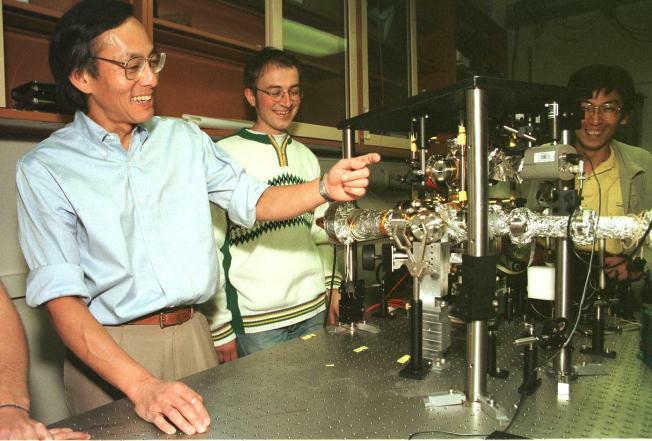 Professor Steven Chu (left) at Stanford University in 1997 demonstrates the use of laser light on interplay of light and atoms with his students. President-elect Obama will name Chu the next Secretary of Energy. President-elect Barack Obama intends to round out his environmental and natural resources team with a Nobel Prize-winning physicist and three former Environmental Protection Agency officials from the Clinton administration. The president-elect has selected Steven Chu for energy secretary, Lisa Jackson for EPA administrator, Carol Browner as his energy "czar" and Nancy Sutley to lead the White House Council on Environmental Quality, Democratic officials said Wednesday. Still unclear is whom Obama will tap for interior secretary. Officials close to the transition said support for John Berry, the director of the National Zoo and a former assistant secretary at the Interior Department, was growing. But these officials also said Arizona Rep. Raul Grijalva and California Rep. Mike Thompson were still in the running. The Democratic officials who disclosed the selections spoke on the condition of anonymity because they were not authorized to reveal names that have not been made public. Obama is expected to make the announcements in the coming weeks. Six weeks before his Jan. 20 inauguration and little more than a month since his election, Obama has chosen much of his Cabinet and top White House staff. He has only a few key posts left to fill: national intelligence director, the secretaries of housing, labor, education, transportation and agriculture and U.S. trade representative. Obama will hold a news conference on Thursday in Chicago to name former Senate Democratic leader Tom Daschle as his secretary of health and human services. That choice has been known for some time. — Chu was one of three scientists who shared the Nobel Prize for physics in 1997 for work in cooling and trapping atoms with laser light. He's a professor of physics and molecular and cell biology at the University of California, Berkeley, and has been the director of the Lawrence Berkeley National Laboratory since 2004, where he has pushed for research into alternative energy as a way to combat global warming. It is the oldest of the Energy Department's national laboratories, doing only unclassified work, and in recent years under Chu has been at the center of research into biofuels and solar technologies. — Jackson, who will be the first black person to lead the EPA, is a former New Jersey Department of Environmental Protection commissioner who worked at the federal agency for 16 years, including under Browner when she was Clinton's EPA chief. Jackson is a co-chairman of Obama's EPA transition team, and currently serves as chief of staff to New Jersey Gov. Jon S. Corzine. A New Orleans native, she grew up in the Lower Ninth Ward, the area stricken by Hurricane Katrina. She holds chemical engineering degrees from Tulane University and Princeton University. — Browner, who served as EPA chief for eight years under Clinton, will become Obama's go-to person in the White House overseeing energy issues, an area expected to include the environment and climate matters. Now chair of the National Audubon Society and on the boards of several other environmental groups, Browner has been leading the Obama transition's working group on energy and environment. — Sutley, the deputy mayor for energy and environment in Los Angeles and the mayor's representative on the Board of Directors for the Metropolitan Water District of Southern California, is the first prominent member of the gay and lesbian community to earn a senior role in Obama's new administration. She was an EPA official during the Clinton administration, including being a special assistant to the EPA administrator in Washington. She also previously served on the California State Water Resources Control Board and was an energy adviser to former Gov. Gray Davis.